But the Wii U should never have been targeted at core gamers, Yoshida thinks. 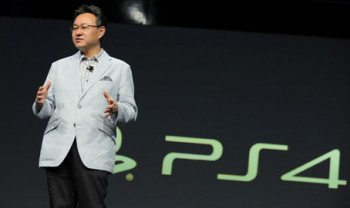 "I have two Wii Us," says Sony's Shuhei Yoshida. "I play Wii U games with my daughters, because they make pretty fun family friendly games." Which, he thinks, is why the world - and particularly Sony - needs a strong, financially stable Nintendo. Get people playing games when they're young, build them up in the hobby, because those who play games as kids will go on to play more games as adults. On consoles other than the Wii U, seems to be Yoshida's unspoken message; but then, Yoshida isn't at all fond of Nintendo's original Wii U focus on core gamers. "I think success or making mistakes depends on how you set your goal," he continues. "I don't know what was Nintendo's goal when they launched Wii U. To me, it was a bit confusing because what they do really well was create some very safe environment for anyone, especially children to enjoy games like induct those people who have never played games ever to become gamers. And they always do very well." Except, when the Wii U debuted, the message wasn't 'family friendly' but 'core gamer', a change in style that, Yoshida believes, really didn't suit Nintendo. Those days are done, and the message is changing, but the console took an early hit that the company's still struggling with. For that matter, it's not just Nintendo that Yoshida would prefer to see strong. "We need each other to create bigger stories," says he of Microsoft. Possibly he has one eye on reports that the next CEO might try to sell off Xbox. That said, if Sony needs Microsoft, should E3 be considered banter between friends? But Sony still needs a strong Nintendo, so Yoshida's among those hoping that, come Christmas, the Wii U maker gets a financial boost. As well as Sony itself, of course; the Profits Santa is going to be busy this year.